MailCrest is the most comprehensive email tracking system, offering a simplified way to track email exchanges over an entire project history. Even if a project lasts for years or involves hundreds of parties, MailCrest captures it all in a secure location. Designed to meet the needs of collaborative projects, MailCrest innovates to track email from various domains. This means you can track intra-company, contractor, vendor and other stakeholder email exchanges, including all attachments, with one simple setup. Today’s businesses rely on email. As a result, emails hold some of the most crucial business information; the problem is that email is easy to “lose” or delete. Organizations need tools and processes to protect those valuable email communications, and are in many cases legally required to do so. 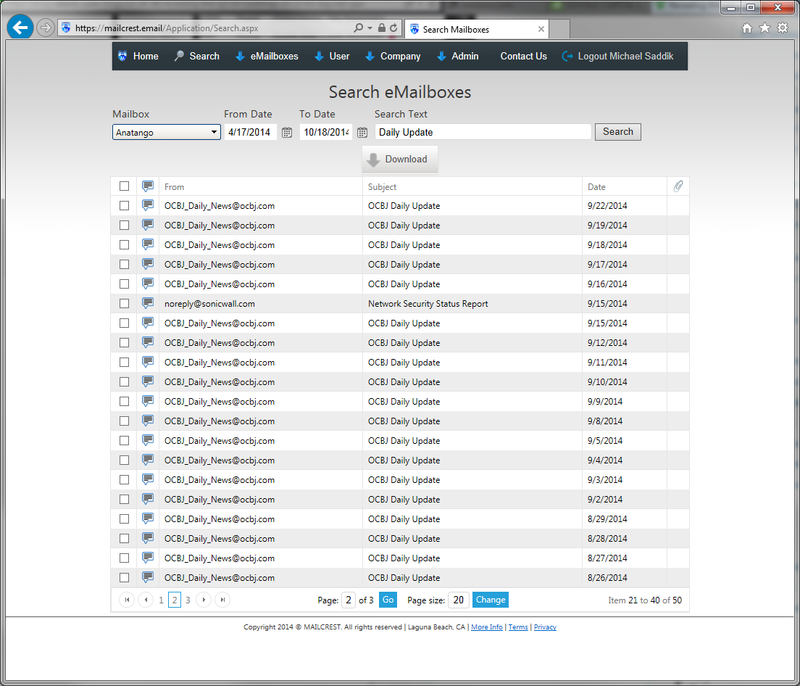 MailCrest provides a single platform to consolidate, protect, and, when necessary, retrieve and review critical emails. Even if you’ve been taking backups and using anti-virus software, you aren’t protecting your email history. You should. Organizations today work with widely distributed teams including vendors, contractors, a revolving door of employees, and many others. Their emails are part of the communication chain, but don’t always originate from the same domain name. That doesn’t mean companies can’t have a detailed business record of their correspondence. MailCrest can be configured to capture correspondence at a project-related level or across the organization. Let’s be honest – compliance can be a headache! We take the edge off. MailCrest’s conveniently and securely stored records, coupled with multi-field search capabilities, make meeting compliance requirements, whether internal or external, easy. MailCrest’s single focus is tracking and securing your email history. We go above and beyond with sophisticated data parsing, encryption, physical security measures, and using multiple locations and types of data storage. MailCrest pushes the envelopes of communication security and archiving technologies with our security process. Feel free to ask us more about it! 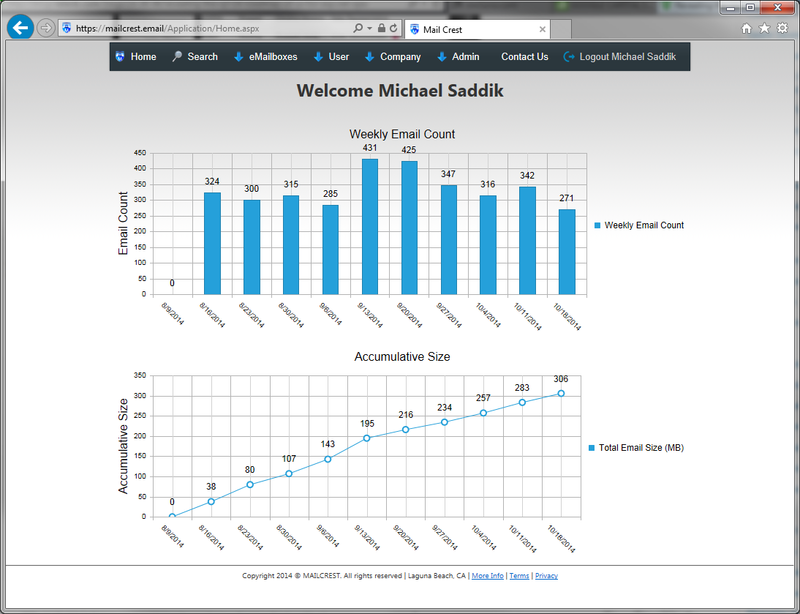 Once your MailCrest system is set up, the comprehensive data that we store and save for you can be used as you see fit. With collected emails in the hands of a trusted custodian, you can then search and find what you need, knowing that it has not been tampered with or deleted. MailCrest’s massive data capacity is designed to securely track, house and manage multi-terabytes of data. When and if you’d like a physical archive, we’ll have it ready for you. A physical archive of multi-year email data can be organized per project or based on other specifications. Your archive is held in locked format and provided as a hard copy upon request. User-based permissions allow secure access for authorized parties only. IP-based access with geographic restrictions prevents hacking or access by rogue users! Customize your user settings to enable various levels of access, as you see fit. We take extra measures to protect your information. Your MailCrest involves a comprehensive email file retained across the cloud, on local server farms, and in Microsoft® Azure Email Archive*, with emails disassembled into searchable parts with encrypted redundant backups. This assures the longevity of your tracking system and high security protection of content, no matter how important it is. You have enough on your plate. We make it easy to get started. Set up MailCrest and never have to think about it again. There’s no software to install, no devices to buy or maintain. MailCrest is SaaS, meaning we’ll have you up and running in a matter of minutes. MailCrest offers many complex benefits in the most simple, user-friendly system. Watch it capture and protect emails in a live demonstration. Please contact us and we will be happy to arrange a demonstration for you at any time.